Research Interest: I. Radiation science research, X-ray imaging, as well as radioisotopes, especially techniques and methods of early detection of cancer. II. Simulation and modeling of X-ray & gamma ray devices as well as medical imaging such as digital x-ray and gamma camera devices. III. Development of a computer prototype for the purposes of protection and assessment of radiation hazards. IV. Medical imaging research includes new methods of imaging for early detection of cancer in general and breast, brain and lung cancers. V. Medical imaging research and imaging methods for cardiovascular diseases and methods of early detection using medical radiology. VI. Applied research for the imaging of tumors using radioisotopes through the use of the SPECT device as well as the PET device. VII. Methods of radiation protection by measuring radiation doses in various X-ray chambers as well as CT rooms for various tests, especially the dose of radiation exposure to the thyroid during early periodic surveys to detect breast cancer, as well as during early detection surveys of osteoporosis. VIII. Methods of imaging and early detection of osteoporosis for children and adults. IX. Molecular Imaging Functional Medical Research and Nanotechnology Imaging. Biography: Dr. Mohammed Ali A. Alnafea Assistance Professor Specialty Nuclear & Molecular Imaging Radiologic Sciences Dept. College of Applied Science (CAMS), KSU Riyadh, Saudi Arabia He worked, taught, and trained in many local and international hospitals as a technologist and a medical physicist for example: King Khalid University Hospital, Riyadh, KSA, (2015-2017). Armed Forces Hospital, Riyadh, KSA, (2013-2015). King Fahad Medical City, Riyadh, KSA (2010-2011). Military Hospital Riyadh, KSA, (2007-2009). Royal Surry County Hospital, Guilford, UK, (2003-2005). Royal Marsden Hospital, London, UK, (2001-2002). Hammersmith Hospital, London, UK, (2001-2002). St. Gorge Hospital, London, UK, (2001-2002). Aberdeen Hospital, Aberdeen, Scotland, UK, (2000-2001). King Faisal Specialist Hospital & Research Centers, Riyadh, KSA (1998-1999). King Saud Medical Complex, Riyadh, KSA, (1996-1998). Awarded Award of the beast presented research work in the 2nd World Congress on Medical Imaging and Clinical Research, France, September 2017. Award of the beast presented research in the 7th Position Sensitive Detector Conference, Liverpool, UK, 2005. KSU Scholarship to study MSc & PhD in UK. Award of the Ideal students of the College of Applied Medical Science based on both Academic achievements and community services, Riyadh, KSA, 1996. Award of the Ideal students of the Secondary School based on both Academic achievements and School Activities, Alzulfei, KSA, 1993. 1. M. A. Alnafea “Monte-Carlo simulation study” Accepted on 28/2\2018 for publication on the 2nd world congress on radiology and oncology. 2. M. A. Alnafea and K. Wells “Monte-Carlo Simulation of Infinia Gamma Camera: A Verification and Validation Process” Nessa J Cancer Sci and Therapy, Volume 1, Issue 7, 1-14, January 2018. 3. M. A. Alnafea, D. Mahboub and K. Wells, “Non-Monte Carlo Methods for Investigating the Application of Coded Aperture Breast Tumour Imaging”, J Cancer Sci Ther 2017, 9:12. 4. A. T. Alotaibi, M. A. Alnafea, “Radiation Dose Awareness Among Radiography Staff”, Austin J Nucl Med Radiother, Vol. 4 Issue 1, 2017. 5. M. A. Alnafea, D. Mahboub and K. Wells, “Non-Monte Carlo Methods Investigating of CA Breast Tumour Imaging”, presented on the 2nd World Congress on Medical Imaging and Clinical Research, France, September 2017. 6. Al-Rabea MW, Alnafea MA, “Role of T Lymphocytes In Chronic Leukemia”, Bangladesh Journal of Medical Science Vol. 16 No. 02 April’17. 7. M. A. Alnafea, K. Z. Shamma, and D. Mahboub, “An Overview of Coded Aperture Families Suitable for Imagining with Position Sensitive Detectors”, ICRM, Riyadh, Feb. 2016. 8. K. Z. Shamma, M. A. Alnafea , O. M. Kadri, “Coded Aperture imagining with gamma camera ”, ICRM, Riyadh, Feb. 2016. 9. O.M. Kadri, M. A. Alnafea, K.Z. Shamma. “Computation and Parameterization of Normalized Glandular Dose using Geant4”. NUCLEAR SCIENCE AND TECHNIQUES 26, 030303 (2015). 10. M. A. Alnafea, K. Z. Shamma and E. A. Albahkali. Performance assessment of the Xrays imaging system fabricated in King Saud University. Scientific Cooperations International Workshops on Radiology IWR 2015, Istanbul-TURKEY, 21-22 July 2015. 11. M.A. Alnafea, O.M. Kadri, K.W. Tearo and K.Z. Shamma. Performance assessment of a digital X-ray imaging system, proposed for 3D-imaging of the uncompressed breast. Journal of Instrumentation, Volume 9, May 2014. 12. M. A. Alnafea, K. Z. Shamma, H. I. Aldousari. Performance Assessment of the GE X-ray Fluoroscopy System at King Saud University. Scientific Cooperations International Workshops on Radiology IWR 2014, Ankara-TURKEY, 7-8 June 2014. 13. Achraf AlFaraj, Asma Sultana Shaik, Mary Angeline Pureza, M. A. Alnafea, Rabih Halwani. Preferential Macrophage Recruitment and Polarization in LPS-Induced Animal Model for COPD: Noninvasive Tracking Using MRI. PLOS ONE Journal, March 2014, Volume 9, Issue 3, e90829. 14. M. A. Alnafea, E.A. Albahkali and K.Z. Shamma. Commissioning and Performance test of localy assembled X-Ray imaging system. IJBPAS, June, 2014, 3(6): 906-914. 15. M. A. Alnafea, O. Kadri, K. Tearo, K. Shamma, Performance and Image Quality Assessment of The 3D X-ray Imaging Systems Proposed for Imaging Uncompressed Breast, accepted in the Conf-IWORID2013, june 2013. 16. M. Alkhorayef, K. Alzimami, A. Alfuraih, M. A. Alnafea, N.M. Spyrou. Measurement of three gamma annihilation by lanthanum-based crystals compared with NaI(Tl) and HPGe. J Radioanal Nucl Chem 291:493–496, 2012. 17. K.S. Alzimami, M. A. Alnafea, N.M. Spyrou, "An evaluation and a comparison of 3DOSEM with resolution recovery (HOSEM) vs flash 3D”, published in ESR 2011. 18. Alfaraj A and M. A. Alnafea, “Single Walled Carbon Nanotubes (SWCNT) intravenous administration during pregnancy: noninvasive monitoring using MRI: Nano Bio Clean Tech 2011, San Francisco, USA to be presented in the 6th International Congress of Nano • Bio • Clean Tech 2011. 19. A. Al Faraj, B. Al Sayed, M. A. Alnafea, E. Canet-Soulas: Noninvasive MRI monitoring of Single Walled Carbon Nanotubes (SWCNT) intravenous administration during pregnancy: effect of size. Contrast Media Research 2011, Texas, USA. 20. M. A. Alnafea, K. Wells, N. M. Spyrou and M. Guy, "Preliminary Monte Carlo study of coded aperture imaging with a CZT gamma camera system for scintimammography", Nuclear Instrument and Method A 573:122-125, 2007. 21. M. A. Alnafea, K. Wells, N. M. Spyrou, and M. Guy, "A Near Field Correction for Coded Aperture Imaging in Scintimammography" Conference Record on 2006 Nuclear Science Symposium and Medical Conference. 22. M. A. Alnafea, K. Wells, N. M. Spyrou, M. I. Saripan, M. Guy and and P. Hinton, "Preliminary results from a Monte Carlo study of breast tumour imaging with low energy high-resolution collimator and a modified uniformly-redundant array-coded aperture", Nuclear Instrument and Method A 563:146-149, 2006. 23. M. I. Saripan, K. Wells, M. Petrou, M. A. Alnafea and M. Guy, "Design of a Multi-hole collimator gamma camera model for use in Monte Carlo simulation". Proceeding of the Medical Image Understanding and Analysis. 1:87-90, 2005. 24. . K. Wells, M. A. Alnafea, A. Tumian, A. Zapros, M. I. Saripan, M. Guy and P. Hinton, "Optimal energy window selection for Emission Computed Tomography". Conference Record on 2005 Nuclear Science Symposium and Medical Conference. 4:2049-2053, 2005. 25. M. A. Alnafea, K. Wells, N. M. Spyrou, M. I. Saripan, M. Guy and P. Hinton, "Optimisation of Coded Aperture Imaging with Gamma Camera System for Breast Tumour Imaging" [Abstract]. Presented at the IWORID-7 Conference, Grenoble, France, 2005. 26. E. A. Al-Bahkali, M. A. Alnafea, and K. Z. Shamma. Design and Analysis of six degree of freedom holder for X-ray imaging system. Manuscript under preparation. 27. M. A. Alnafea, D. Mahboub, O. M. Kadri, K. Z. Shamma and A. Al Faraj. Proof of concept in utilizing X-ray back scattered photons for uncompressed breast mammography imaging and diagnosis system. Submitted to the journal of La Radiologia Medica. 28. M. A. Alnafea, D. Mahboub, O. M. Kadri, K. Z. Shamma and A. Al Faraj. Experimental and Monte Carlo Simulation Study of Digital X-ray Mammography Systems: Performance Assessment. 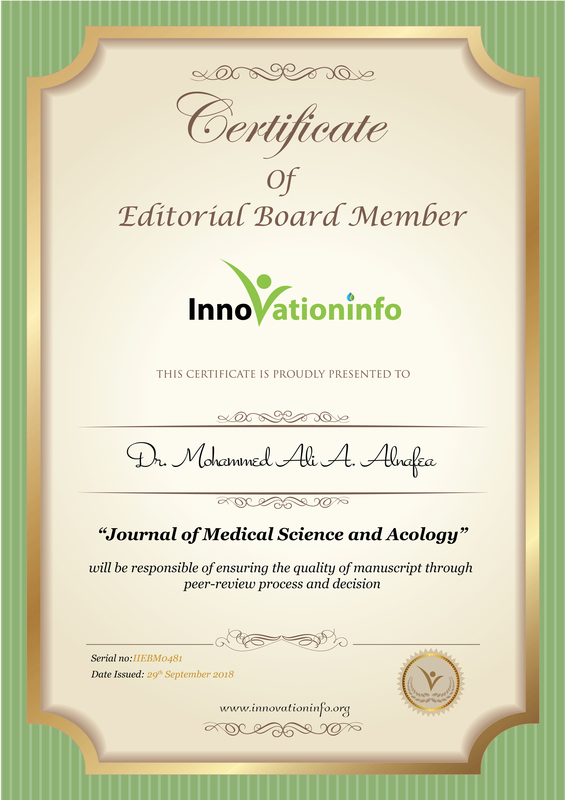 Submitted to the journal of Accreditation and Quality Assurance.